Although born in Canada, I’m Ukrainian. Both my parents were born in Canada, but I’m Ukrainian. My grandparents, except the one I sort of share a name with who was born in Canada, were Ukrainian. And I believe everyone else in my family, right back to the time dinosaurs roamed the earth were Ukrainian. Even a few dinosaurs where named after my family, the Iloveperogysauras, and the very rarely seen Nylysknykysauras are mentioned in footnotes at the Royal Tyrell museum. I love being a Ukrainian. I love our strong men and women. I love our family values. I love, love, love, love our food. So to all of you Ukrainians, wannabe Ukrainians, and other Orthodox peeps, I wish you all a very Merry Christmas! (To my Anglican chums, do not despair! I’m a protestant through and through and only have vague memories of the Orthodox church!). (Not that it matters really). (Because we are very cool and loving of all sorts). Tonight I should have at least 30 people in our apartment to celebrate Ukrainian Christmas, but I am caught up in the busy-ness of our modern age, and don’t remember any of the traditions of my past, except to be exiled to a remote table in the corner of the kitchen with my cousins. 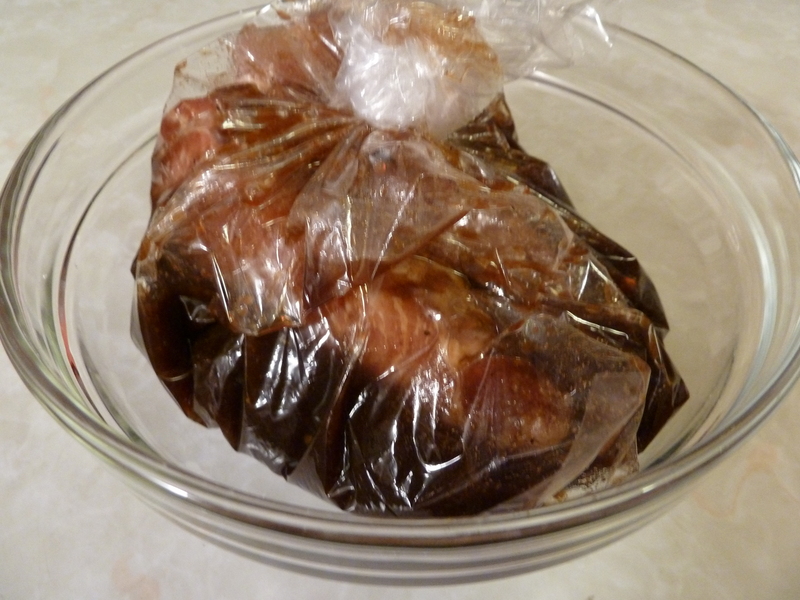 Tonight I am simply marinating some pork chops for our supper tonight. The idea of cooking cabbage rolls, perogies, a turkey, nylysknyky, a ham, gathering fresh rolls from Safeway, sour cream from the corner store, and other Ukrainian staples, is just too much to comprehend. I was inspired to cook pork tonight by Chris from Eating is the Hard Part. This amazing young man has inspired me many times to try something new, but this particular post reminded me that a) I had frozen pork in the freezer, b) I love pork, and c) there are other ways to cook pork than just frying it up on top of the stove. I had a few Facebook friends concerned this was for breakfast, when I commented at 7:00 a.m. that I was marinating pork, but as you can see, the pork was wrapped nicely and sat in the fridge the whole day long whilst I was at work today. Chris’s blog talks about a thinned teriyaki marinade, and I took that idea and used Kejap manis, garlic, oil, vinegar, chilies, and an assortment of other odds and ends found in the cupboard and refrigerator (seriously, I’m the worst food blogger. I do whatever inspires me at the moment. I don’t think to document details at the time. Wish I did though. It’s like I forget I write a food blog). Anyway, I threw together a bit of sweet, a bit of sour, a bit of spicy and a dash of this and a sprinkle of that, and voila, you have marinade. Now, the test is this. I am going to broil these babies, which is fearful to me. Whenever I broil, I have memories of my Mom and Dad experimenting and cooking steaks under the broiler and THE BIG FIRE that resulted from the experiment. No, our house didn’t burn down, but there was smoke. There was fire in the oven. There was Mom shouting at us to open windows. There was definitely anxiety and stress – so of course, I have adopted this as part of my being whenever I “broil”… even if it’s to melt cheese on a piece of toast, Michael dons an asbestos suit and I use utensils 6 feet long to access items in the oven. 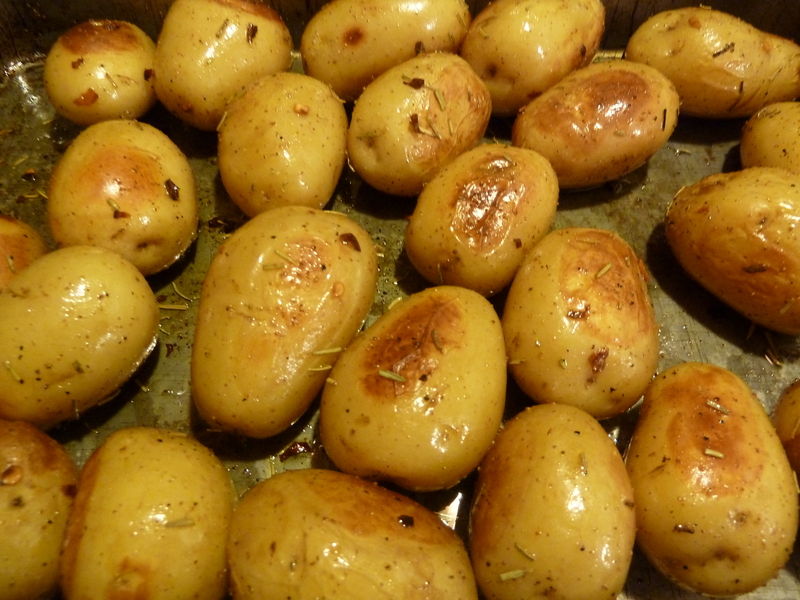 I should be avoiding starch and eating things like egg plant or beans or other things that are green or purple or orange, but Michael went shopping this past weekend and came home with a Costco sized bag of baby potatoes, so these little darlings are currently roasting in the oven. These potatoes are, seriously, god’s gift. You don’t need to wash them. You just need to toss them in a pan with a bit of olive oil, herbs, spice, whatever inspires you, roast at 425 for however long, and hey presto, you have the best potatoes known to man. Yum. 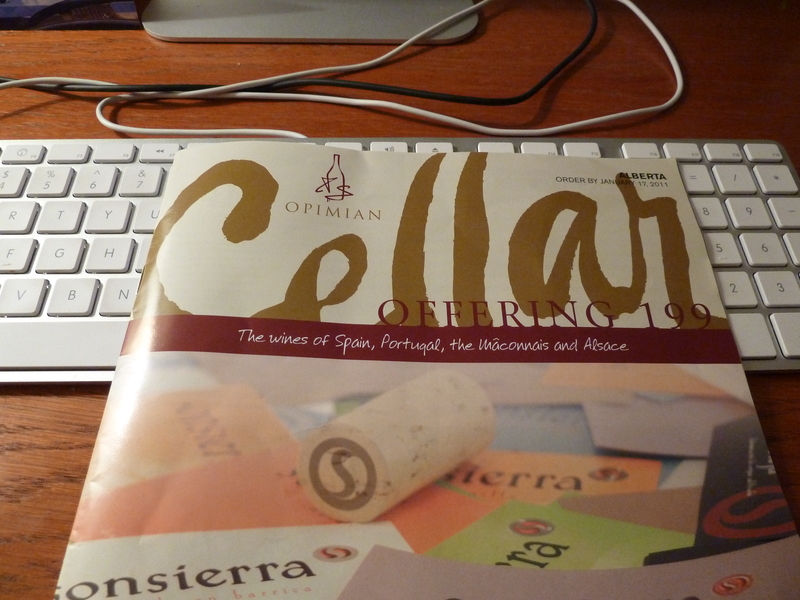 I am going to spend the remainder of my evening, provided of course we survive The Great Broil Your Pork Experiment, is to review my newest wine venture, and peruse the Cellar magazine from the Opimiam Wine guild, that came in today’s mail and decide what wine I would like to buy in bulk for little apartment. You’d think I’d learn. Okay, postscript. The windows have been flung open, fans are set on “high” as we de-smoke our humble abode. Michael and I were laughing at the memory of my Mom and Dad’s broiling steak experiment, and little did we know we had a small oven fire on our hands. At the time of writing, the pork is still edible. The building, however, and we apologise to fellow tenants, will reek of burning oil, pork, rosemary, garlic and chili for probably a good week. Isn’t this the fun of cooking? Happy Ukrainian Christmas! Your pork marinade sounds very similar to one I use for pork tenderloin but I roast the tenderloin, not broil it. And yes, little baby potatoes are God’s gift to humankind. Well, at least you know that the smoke alarm works! Egad flames! I love the story. Hopefully you’ll give it a crack again one brave day. Thanks for the shout out by the way. I’m glad our little community of foodies can inspire each other. I think this is an incredible ORTHODOX meal in a very UNORTHODOX way! YUM!